Chronopia – Sons of Kronos (and MIB update) | Azazel's Bitz Box. While working on some assignments the other week, I needed some way to ease my stress. While taking breaks, rather than playing videogames, watching TV or reading (more reading – ha!) I decided to pull a part-painted figure out of one of my cases and try to finish it. 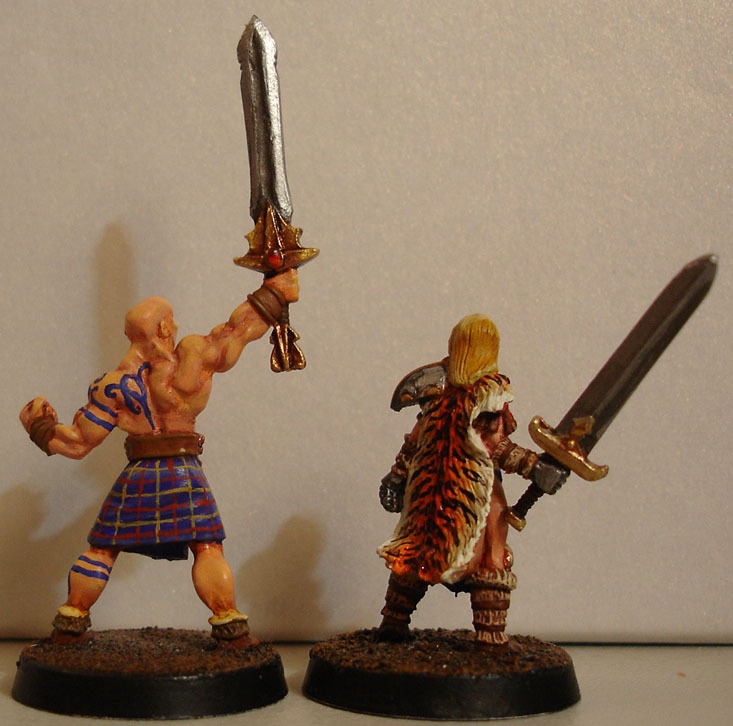 In this case, a Barbarian Son of Kronos (I think) who had been based and simply had some unshaded fleshtone applied. I finished him the same day. I then started on the figure next to him in the case, a Chronopia Sons of Kronos Blade Maiden, who also had simply been based and has some of her flesh basecoated. I finished her the next day. Painting models – I found it to be a great stress relief and also great to motivate me to do my work – since I made myself do more reading/writing in-between paint breaks – which was much more rewarding than the assignments! The tartan looks a bit better in person, what with the figures being about an inch tall. Looks much more messy when blown up like this. The markings on the guy are meant to be woad warpaint, though I wanted to avoid the “Braveheart Lite” look, as well as overly-intricate patterns. I was initially going to put some on her as well, but she’s already quite busy with a lot going on so decided against it. As for Chronopia itself, I bought the rules and a few semi-random figures when the game came out, but my group never got around to playing it. The figures therefore won’t be painted as proper forces, more likely a few nice display models and perhaps a few will be drafted into 40k-ish or LoTR forces. Much the same as the majority of my WHFB stuff. Also a small update to the MIB figures from a few posts ago. I wasn’t satisfied with the sunglasses or the whatever-it-is on the bottom of that one guy’s pistol, so I touched them up. 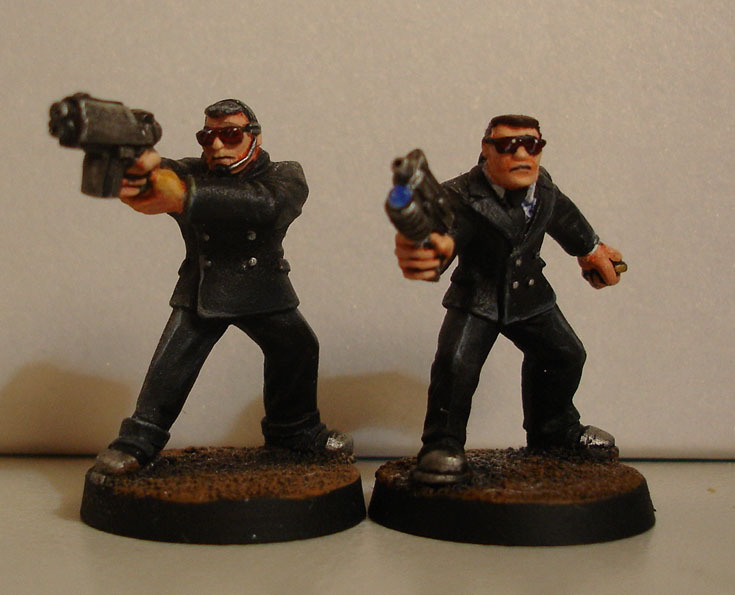 The gloss varnish on the glasses hasn’t come out in the photo, and the thing on the guy’s pistol has been painted as a tac light, though it’s a little out of focus in this photo. Win! 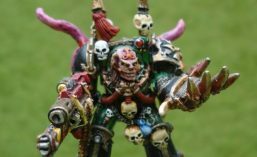 This entry was posted in Fantasy Gaming, Miniatures & Gaming, Warzone and tagged blade maiden, chronopia, Miniatures & Gaming, painting models, warzone. Bookmark the permalink. ← Red Box Games – Size Comparisons with GW Lord of the Rings figures. Pingback: Chronopia: Sons of Kronos Hunter, Barbarian and Blade Maiden. | Azazel's Bitz Box.